MECHANICSVILLE, Md. 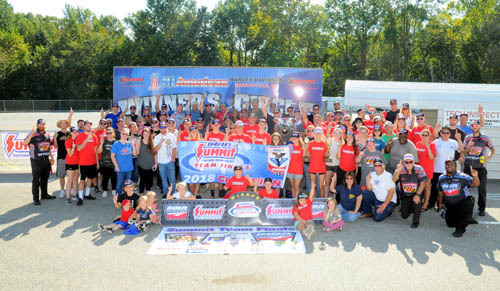 - Maryland International Raceway claimed the championship at the International Hot Rod Association (IHRA) Division 1 (Patriots) Summit Team Finals held over the weekend at Maryland International Raceway. Maryland International Raceway captured the team title 63-37 over US 13 Dragway which finished the weekend in the runner-up spot. 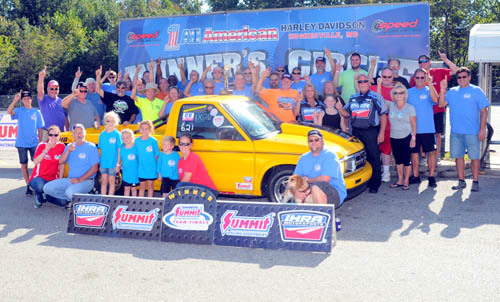 Other tracks who participated were: Capitol Raceway, Richmond Dragway, Sumerduck Dragway, and Motor Mile Dragway. Leading up to the main event, racers participated in a Gambler's, Bogey, Golf Cart, and Big Wheels races and "best of" awards. John Myers (Capitol Raceway) defeated Mickey Nelson (Maryland International Raceway) .001 reaction time with a 6.23 elapsed time at 109.85 mph on a 6.21 dial-in on a 109.85 mph run. Nelson had a ..010 reaction time and went down the track with a 4.80-second pass at 140.69 mph. 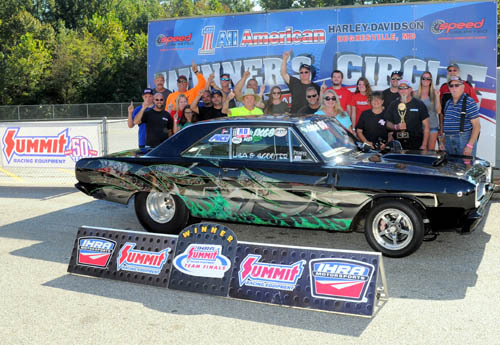 Chris Moren (Richmond Dragway) claimed the top prize with a .026 reaction time and 5.94-second run at 112.52 mph. Runner-up Jonathan Martin (Richmond Dragway) went down the track with a .022 reaction time and 5.91-second pass at 111.52 mph. 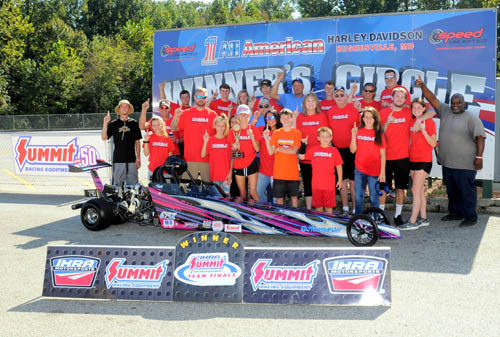 In a battle of Maryland International Raceway drivers, Tori Tayman took home the victory in Junior Dragsters over runner-up A.J. Jenkins. Tayman went down the track with a .046 reaction time and a 7.91-second pass at 81.09 mph. Jenkins had a slightly faster .037 reaction time with a 7.89-second pass at 81.49 mph. Mike Anderson (Sumerduck Dragway) defeated Royce Miller (Maryland International Raceway) with a ..068 reaction time and 13.42-second pass. Miller went down the track with a .077 reaction time at 14.76 seconds. Top - Alex Bradford (US 13 Dragway) 4.87 on a 4.85 dial-in, .029 reaction time defeated Eden Lukhard (Richmond Dragway) 5.02 on a 5.02 dial-in, .122 reaction time. Mod - Kevin Yates (US 13 Dragway) 6.05 on a 6.02 dial-in, .015 reaction time defeated Steve Cross Sr. (Maryland International Raceway) 6.37 on a 6.38 dial-in, .061 reaction time. Junior - Dylan Witherow (Sumerduck Dragway) 7.95 on a 7.94 dial-in, -.004 reaction time defeated Jordan Witherow (Maryland International Raceway) 8.04 on a 8.05 dial-in, -.026 reaction time. Top - Jason Kirby (Maryland International Raceway) 4.81 on a 4.61 dial-in, .029 reaction time defeated Ben Calhoun who red lighted (Sumerduck Dragway) 8.55 on a 4.68 dial-in, -.006 reaction time. Mod - Kevin Pollard (Motor Mile Dragway) 5.30 on a 5.30 dial-in, .016 reaction time defeated Tony Mattera (Maryland International Raceway) 6.61 on a 6.62 dial-in, .018 reaction time. Junior - Peyton Bunch (Sumerduck Dragway) 8.77 on an 8.58 dial-in, .015 reaction time defeated Hailey Pumphrey (Richmond Dragway) 8.00 on a 7.92 dial-in, .236 reaction time.